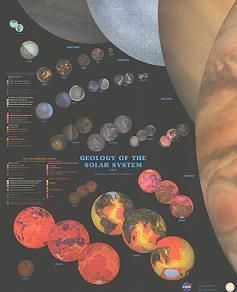 The Geology of the Solar System poster uses the geologic knowledge that we have learned from studying our planet, to conjecture as to the make-up of the other planets and their satellites. Multiple images of selected moons and planets allows for full viewing of all the surfaces. It is a double sided poster displaying informative text for various planets and planetary systems. A long list of reference publications invites further inquiry.